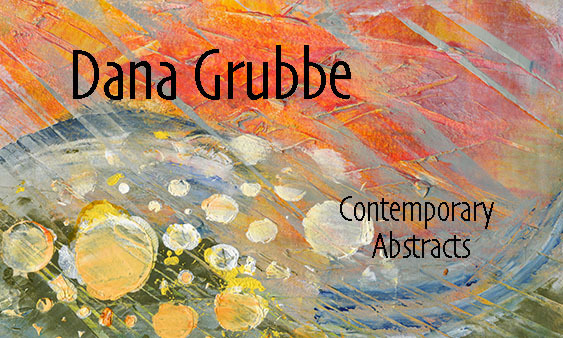 On April 4th, 2019, I am the guest speaker at the Columbus Cultural Arts Center’s “Conversation and Coffee”, where I will be discussing the Science of Acrylic Pours. This post is a copy of a 4-page handout I have prepared to accompany my talk. Following the handout are photos designed to add clarity. 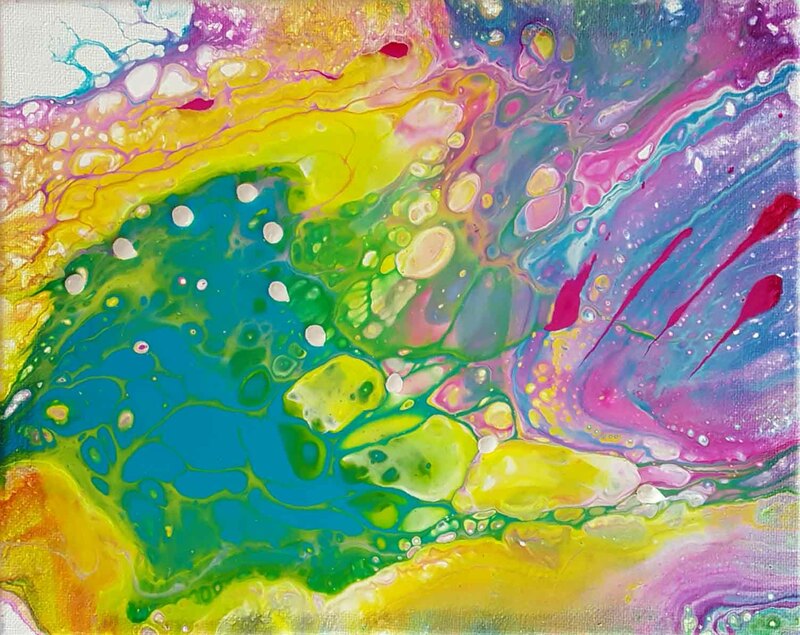 The picture above is the acrylic pour I made while taking the photos. I added some iridescent pearl drops across the center after the pour was complete. 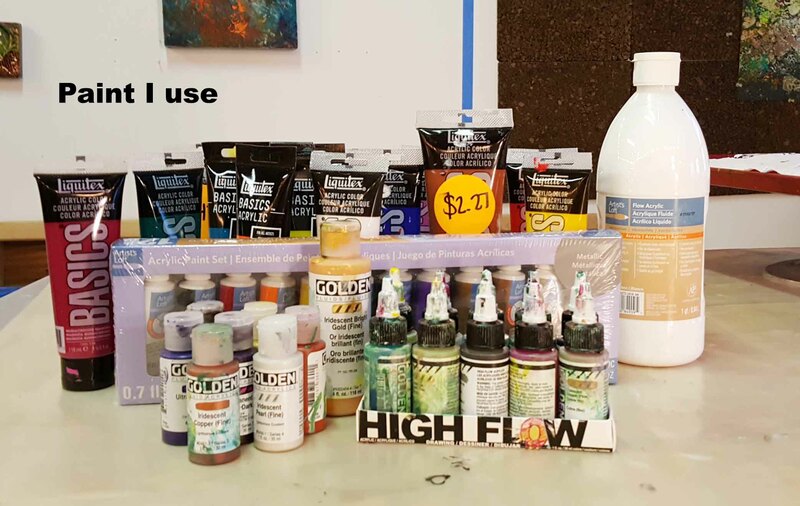 What makes Acrylic Pours “work” is that different pigments have different specific gravities; that is, some colors are heavier than others. 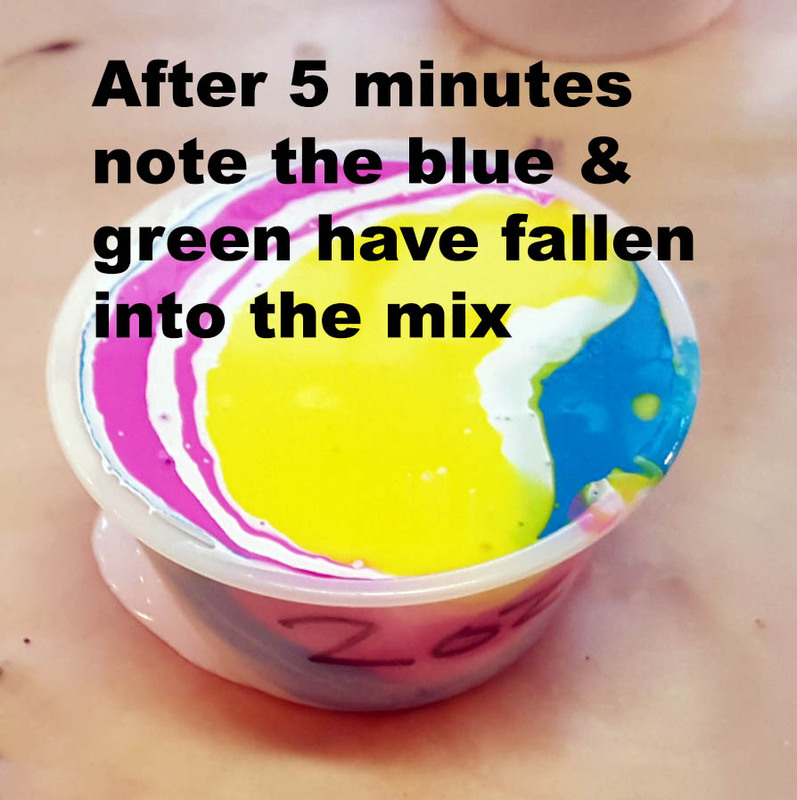 In the process that follows there are two times when you allow the paint to sit for at least 5 minutes and during that time, in theory, some paints are rising and some paints are falling. 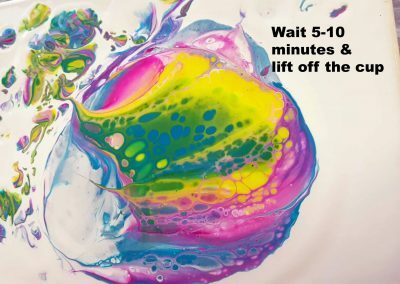 When your painting is complete, it is still moving until it dries. 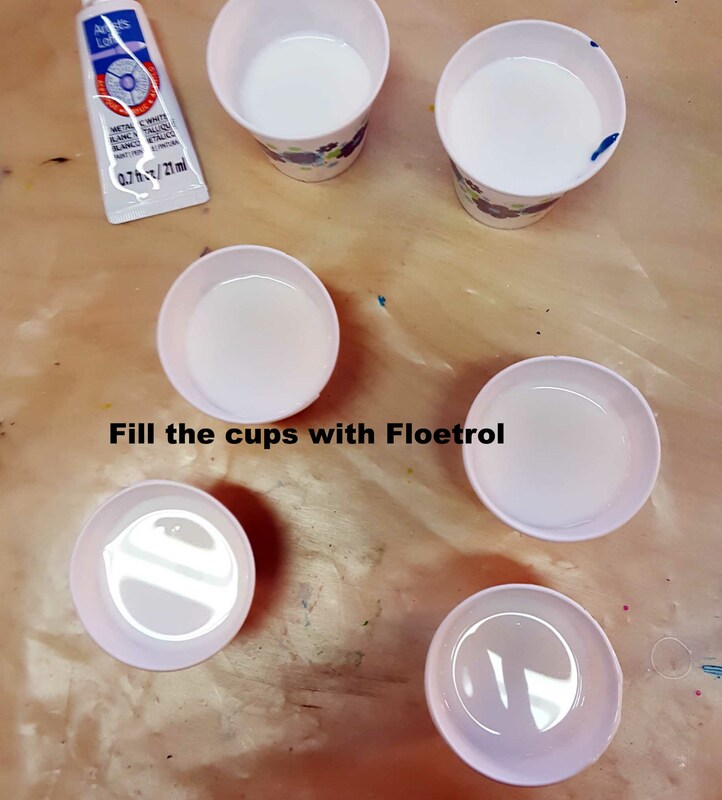 Make a 10:1 mix of water to Floetrol in the water bottle. 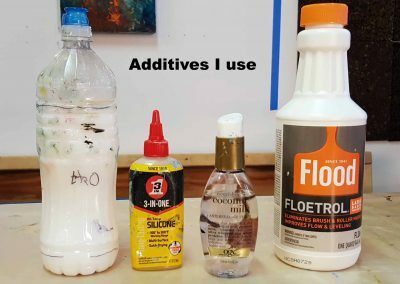 Use the ratios shown below: Paint to Floetrol. 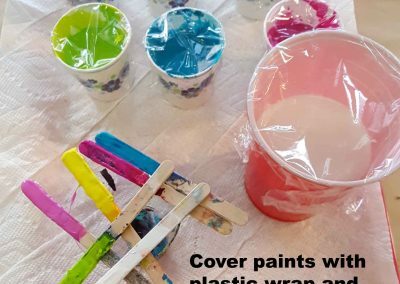 Stir with popsicle sticks, add a little of the 10:1 mix if needed to make the paints runny. FIRST color in the cup will be your top color. 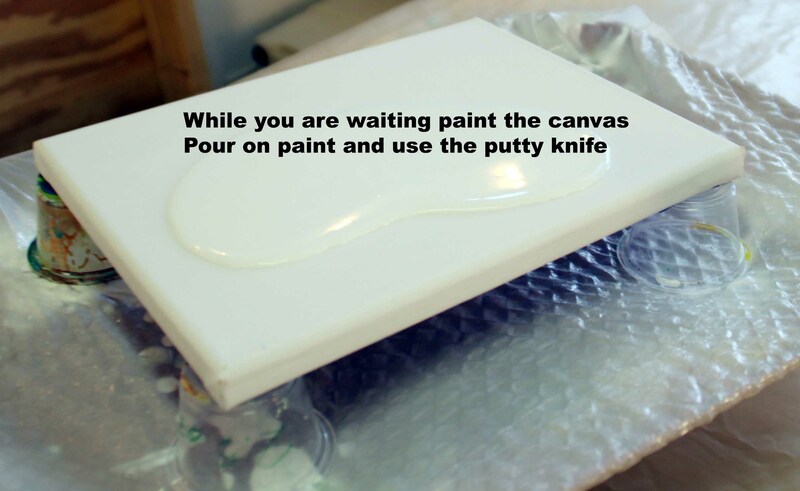 Pour on the paint and apply with the plastic putty knife, being sure to cover the edges too. 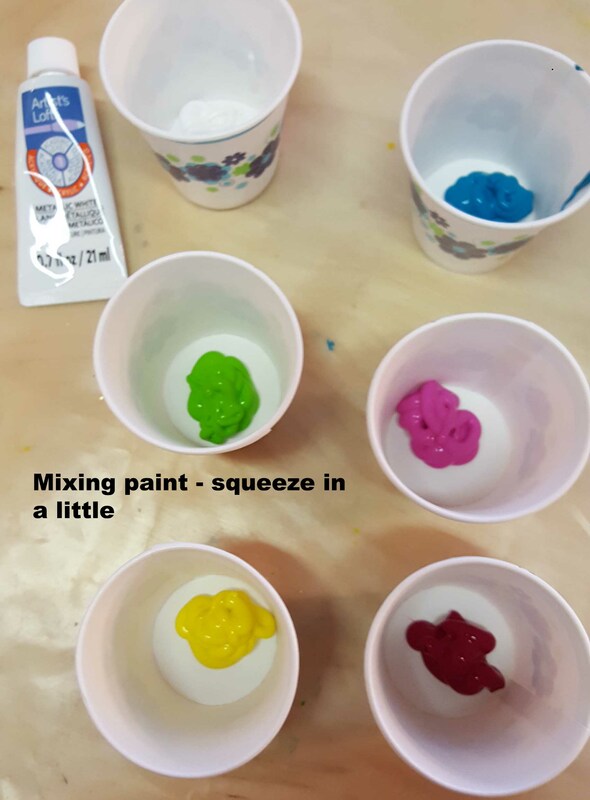 Be generous with your paint, you want the surface to be wet enough to allow the paint in the cups to slide around. 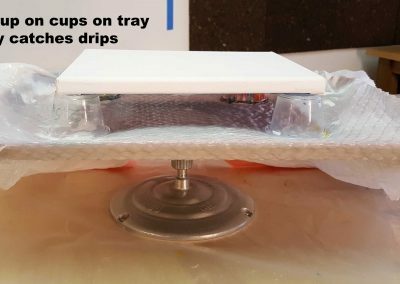 Wearing your gloves, grip the bottom support and gently begin to tilt the substrate, allowing the paint to flow across the surface. 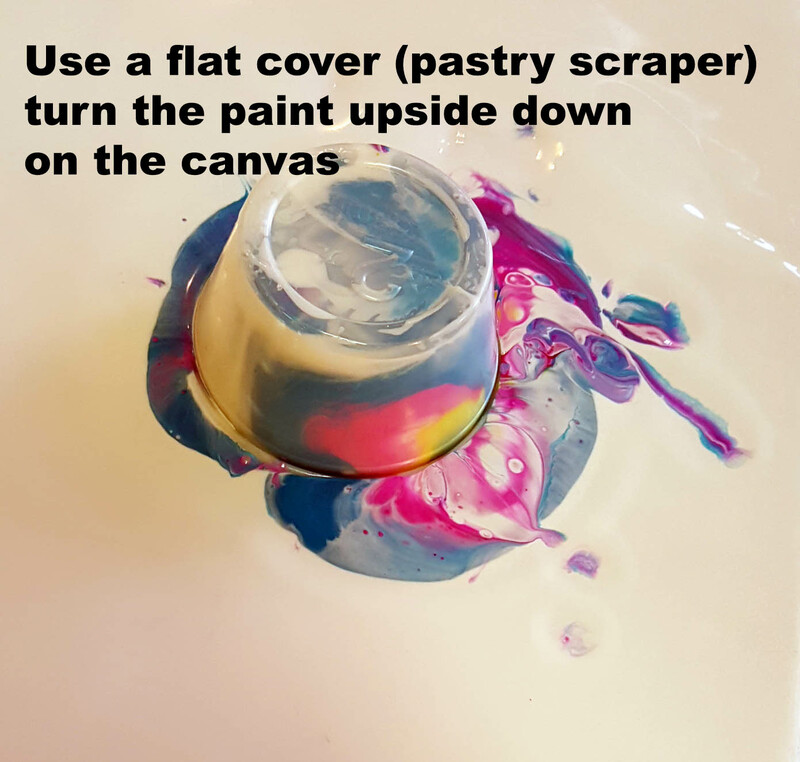 Tilt it back to level and flow the paint in a different direction. Continue in this manner until the surface is coated. 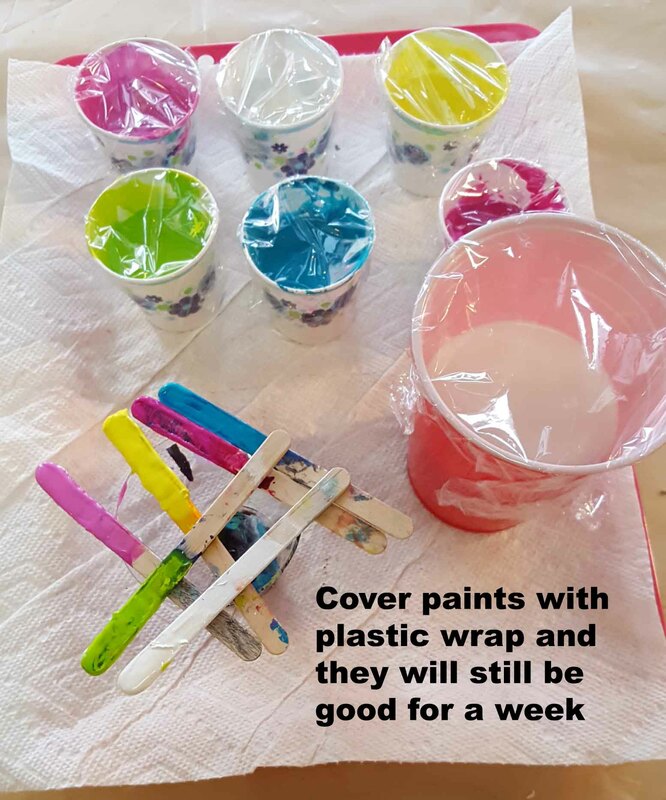 Paint generally flows down the sides and if some sides are not covered (and you want them covered), this is a good time to use your finger and “paint” the edges. If you want to add a rich metallic color use the Golden Iridescent Gold Deep. 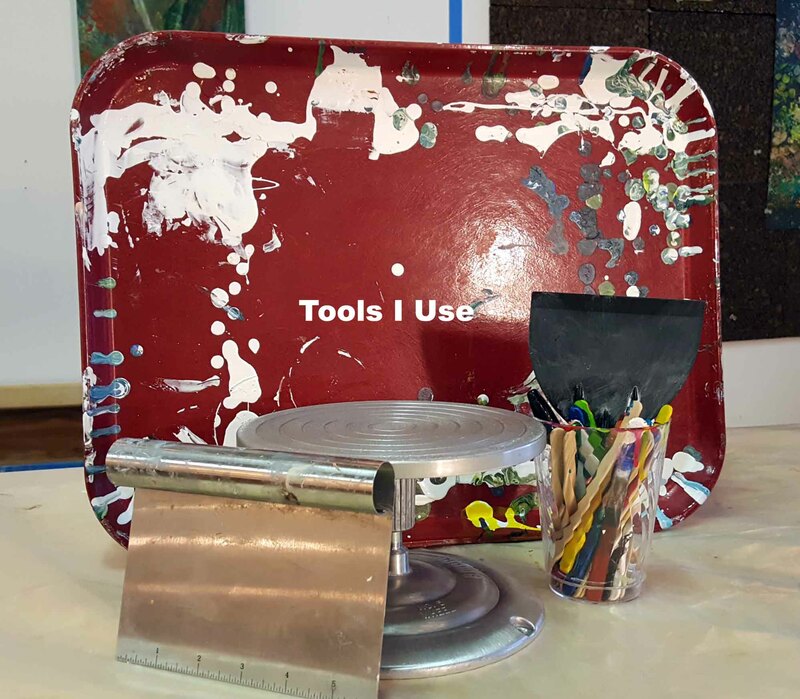 Once you are happy with your painting place it on a level surface (over plastic) and allow it to dry. DO NOT BE SURPRISED to find that the painting continues to change for a while. 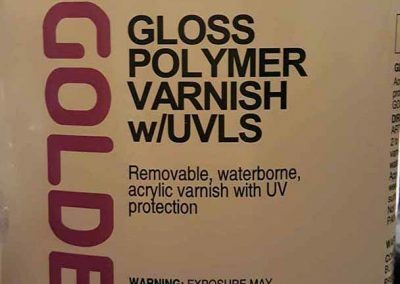 I use GLOSS varnish; Matte varnish has white in it. 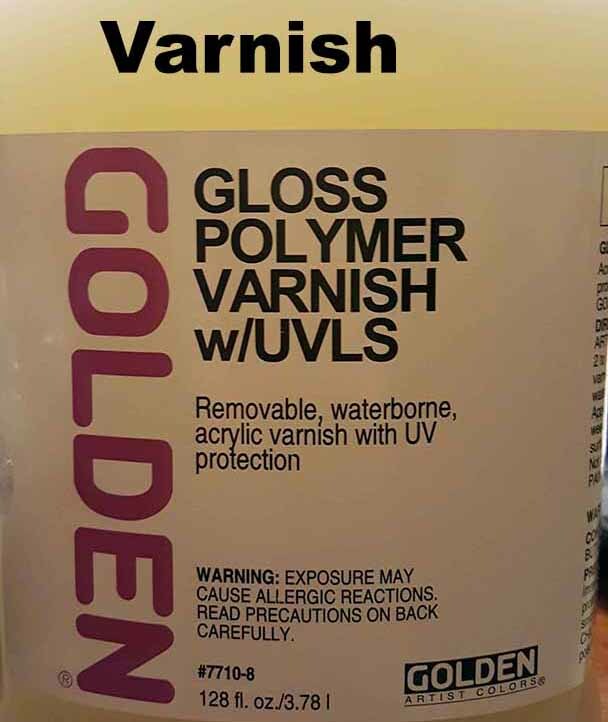 For brush application, Golden’s Polymer Varnish should be diluted with water: 4 part vanish to 1 part water. Store it in a Tupperware type container with plastic wrap under the lid. Keeps for months.. I varnish once a day for 3 days (you CAN do a coat every 8-10 hours but I prefer to make sure it is dry). 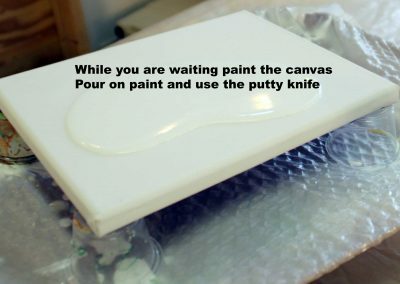 The painting should be flat and level when the varnish is applied and while it is drying. 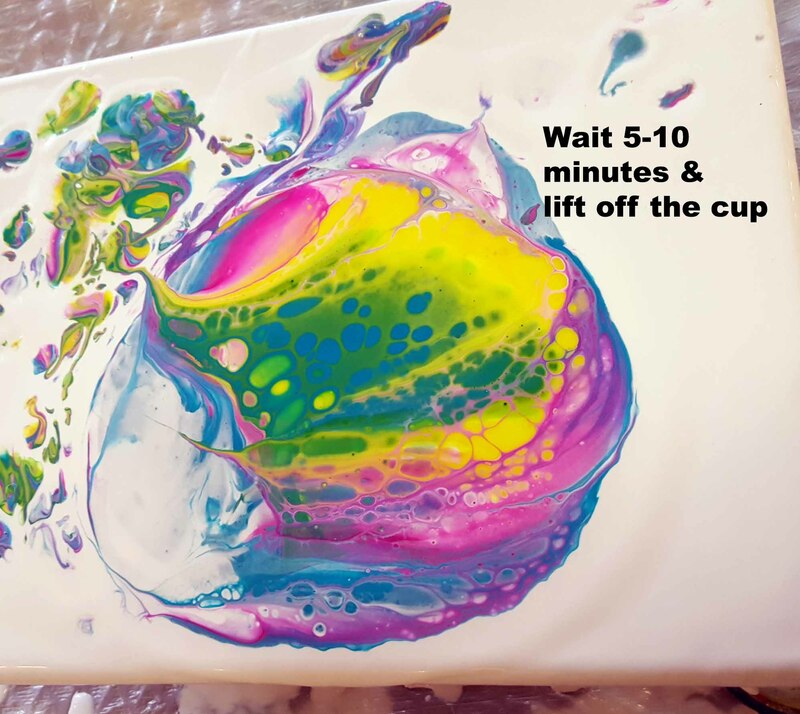 Acrylic pours can be heavy. 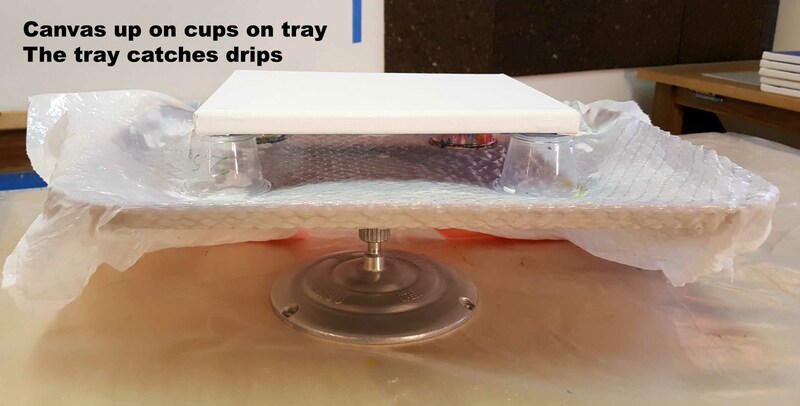 If you are using a canvas that is not ‘drum-tight’, your paint can pool in the center of the canvas and have trouble drying or crack later due to movement. 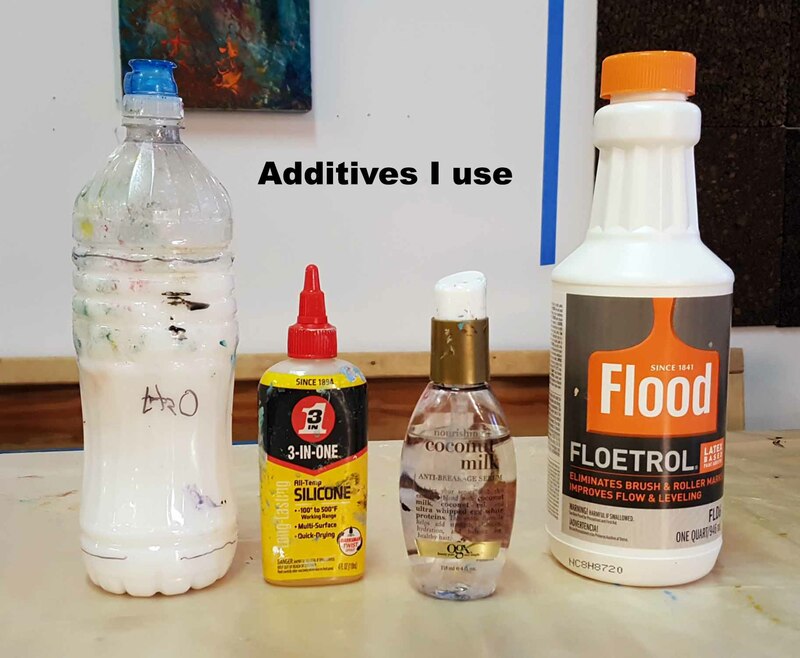 People report that Floetrol will thicken and you end up pouring clumps into your paints. I haven’t had this problem unless the Floetrol is really old. 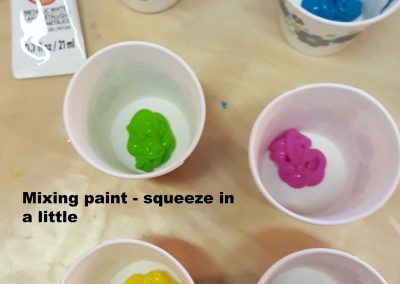 Sometimes as your paint is pouring out or starting to dry you will get bubbles. There are several common solutions. 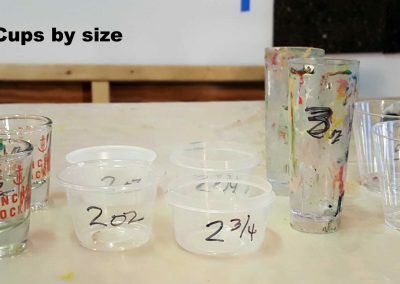 Did you use the right size cup for your substrate? Did you fill that cup all the way? 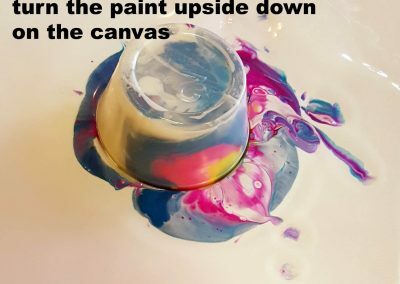 I know from my first experience that if my cup is too big and I am trying to save paint and don’t fill it to the very top, then when I turn it upside down the paint rolls down the side of the cup and makes mud. 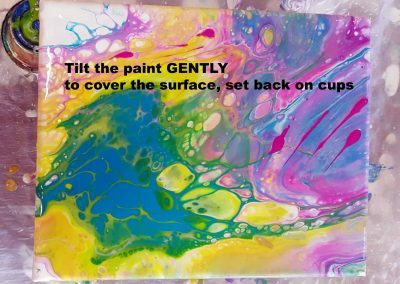 I often use two cups, especially if it is a larger canvas. The cups can be different sizes but will have some similar colors. 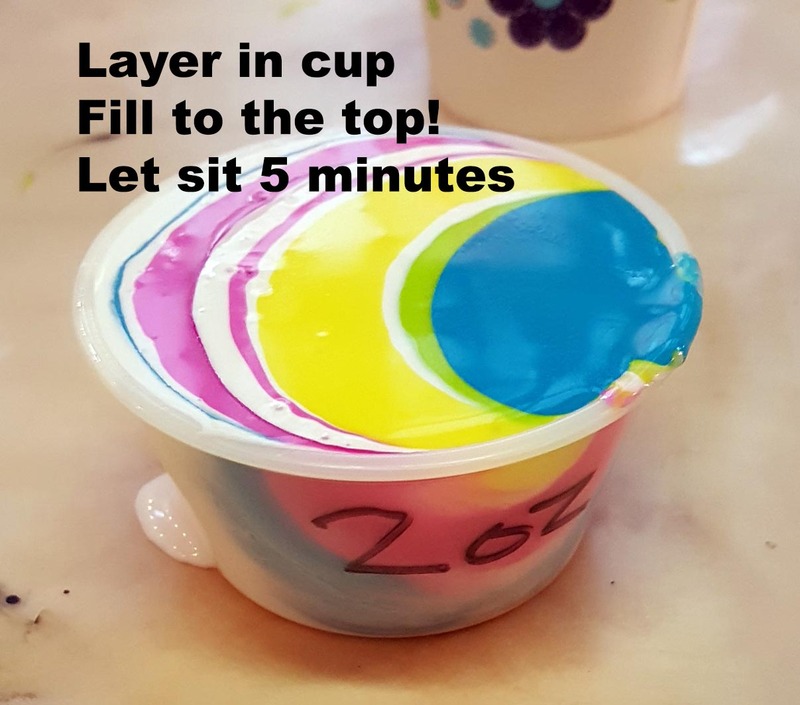 I remove the paint cups at the same time and tilt the colors together to create an integrated pattern. 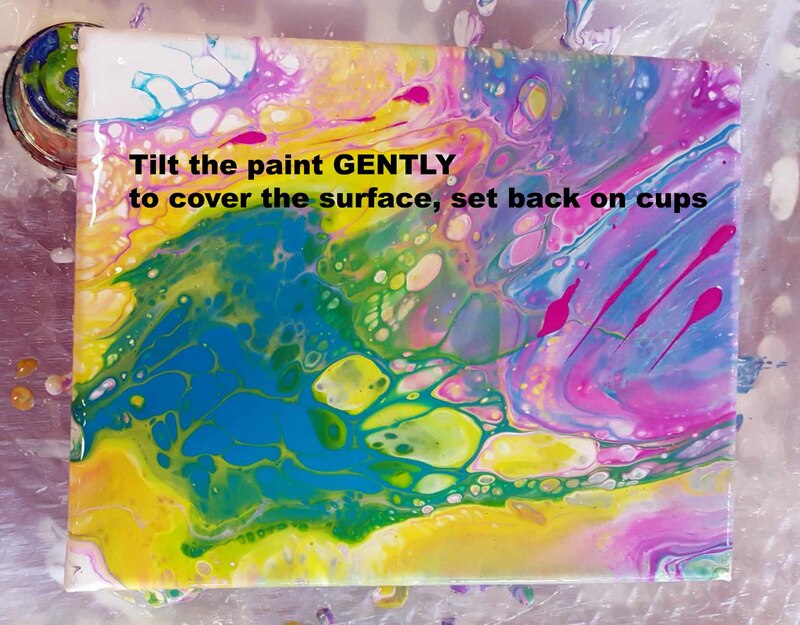 Never pour acrylics down the drain, use paper towels to remove paint. Clean with soap and water. 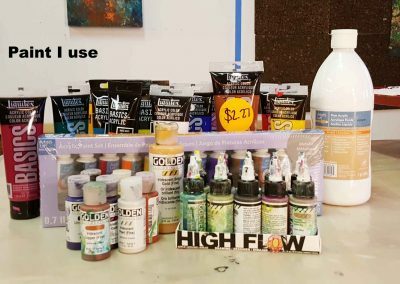 I use the Golden paints for accent and generally don’t mix them with Floetrol. Well used containers. 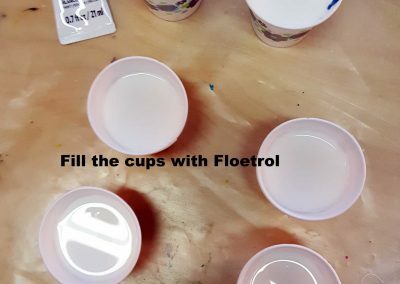 The water bottle is a 1 part Floetrol to 9 parts water mix. 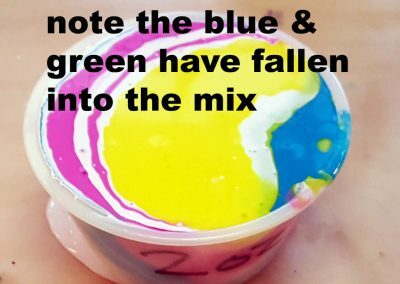 I add it to the paint cups if the paint is too thick. 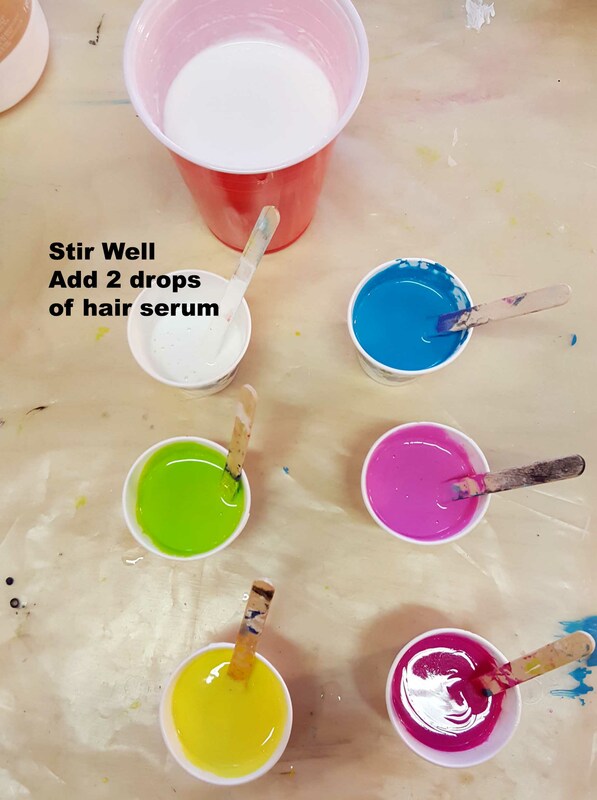 Mix a small amount (4 parts of varnish to 1 of water). Seal tightly and it will last for months. It’s important to have enough and it is important to fill cups to the top. Knowing exact sizes saves paint. 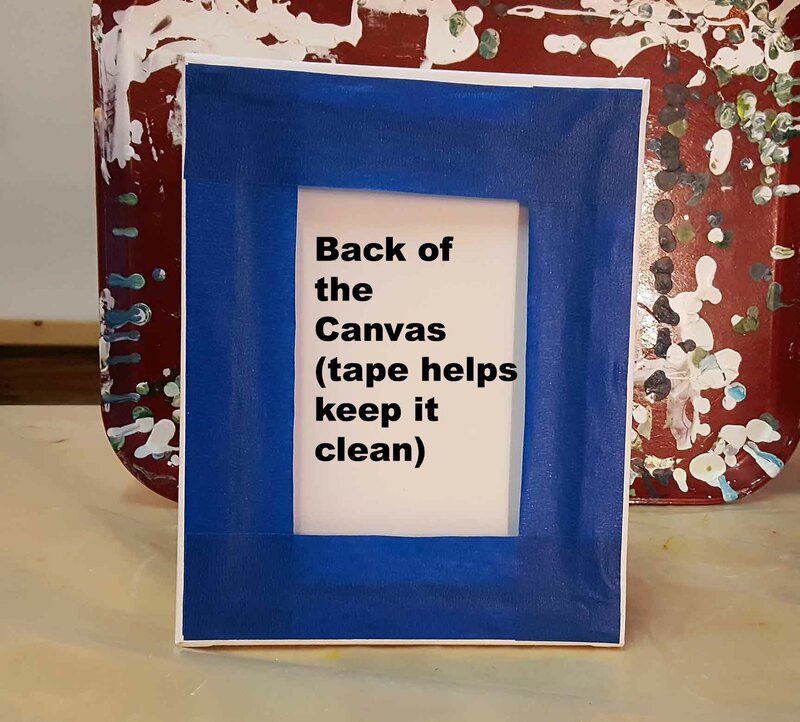 When the piece is complete I will peel the tape and the back should be clean. 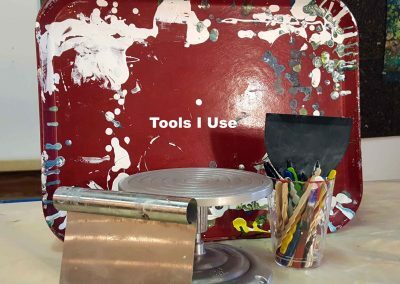 As you can see, I don’t use a lot of paint. 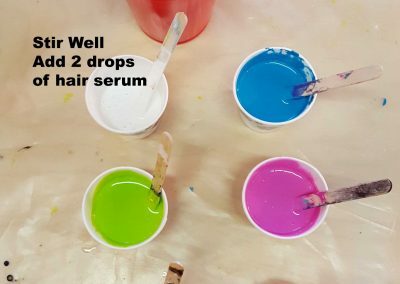 Don’t forget to add 1-2 drops of the hair serum. Look at the previous picture. See how the green and blue have partially fallen below the surface. Gently lift up the cup. 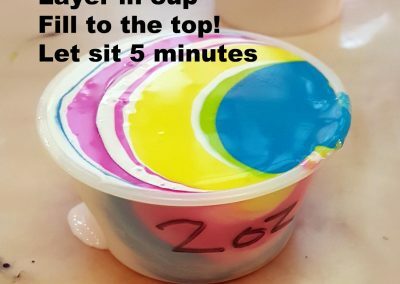 The extra drops are from the inside of the cup (shake them out). 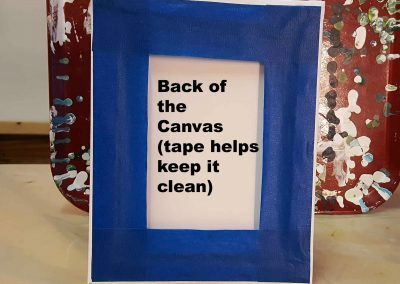 Gently tilt the canvas backwards and forwards at a slight angle to move the paint around. 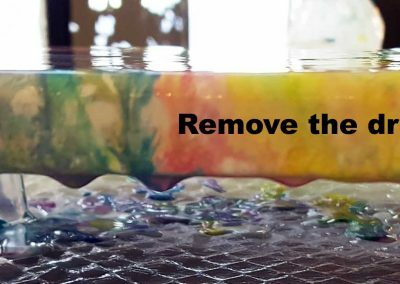 Use a popsicle stick to remove the drips from the bottom. Thank you for the comprehensive instructions; I had a lot of questions after seeing random YouTube videos, and this blog answered them. That’s great Amy, you’ll have to post your pours somewhere so I can check them out!